Knowing where to put your money can be tricky step when it comes to investing, but it may get easier as a recent study by LocationScore.com revealed 15 capital-city suburbs with outstanding growth potential. The research revealed top three suburbs for rising relative demand in Sydney, Melbourne, Brisbane, Perth and Adelaide. While increased real estate prices are expected to follow, LocationScore.com.au Director of Research Jeremy Sheppard underscored these suburbs are top of mind for investments. Topping the list are Baxter in Melbourne, Ferny Hills in Brisbane, and Birkenhead in Adelaide. 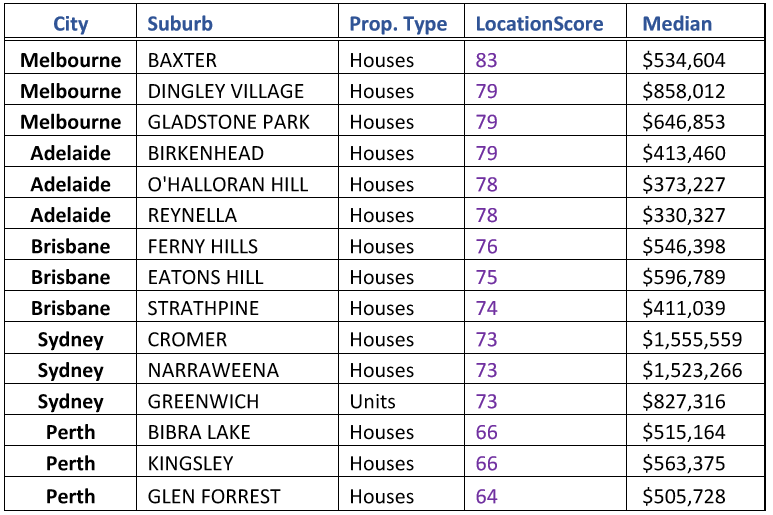 Notably, all of these suburbs had a median house price below $550,000. In fact, over half the identified suburbs with the most potential are priced below $550,000, a price point considered accessible for most capital-city buyers. Digging deeper into the data, Sheppard named Melbourne the “winner” among other cities after its suburbs held the top three spots across the 15 locations. Adelaide, meanwhile, boasted the strongest results in the demand vs. supply study. Its suburbs came in second after Melbourne. “Combined with its relative affordability, Adelaide is a city that could yield excellent outcomes for savvy investors,” Sheppard said. There are also pockets set to continue their growth in Sydney despite the discouraging news that has loomed around the city’s local market lately. Below is the complete list of 15 locations identified in the study. In the past, over 80% of LocationScore.com’s top picks outperformed the overall Australian property market growth rate.